After 25 years in power, the African National Congress has become tainted by widespread allegations of corruption, which forced out Mr Ramaphosa’s predecessor, Jacob Zuma, last year. South Africa faces elections on 8 May. 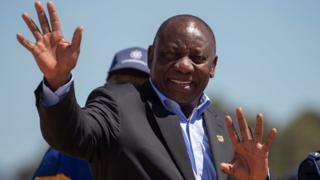 Mr Ramaphosa’s announcement of the eight-member panel comes a day after the largest opposition party, the Democratic Alliance, said it would place the fight against corruption at the heart of its election campaign. “I want to say to all the politicians, if you are corrupt, you can expect to spend 15 years in jail,” said DA leader Mmusi Maimane at the launch of its manifesto. Mr Ramaphosa has vowed to tackle corruption since coming to power. In his State of the Nation Address earlier this month, he announced the creation of a special investigating team to deal with serious corruption and associated offences within the National Prosecution Authority. But in November 2018, he was forced to repay $35,000 (£27,300) given to his leadership campaign by a firm accused of corruption. The revelations were made at an ongoing judicial inquiry into “state capture” – the allegation that under Mr Zuma, the state was effectively taking instructions from businesses which used corrupt politicians to further their own interests. The Gupta family have been at the heart of these accusations. One allegation is that Ajay Gupta offered a bribe of $42m (£32m) to ANC politician Mcebisi Jonas to take up the post of finance minister. Ajay Gupta and his two brothers deny all allegations of wrongdoing and earlier this month a warrant for his arrest was cancelled. The judicial inquiry is also looking into allegations of corruption at state-owned power firm Eskom, which are allegedly one factor behind a recent spate of nationwide power cuts. Mr Zuma is on trial for alleged corruption relating to a multi-billion dollar arms deal in the 1990s. He has denied any wrongdoing.